Francisco de Jesus Fernandes, from the Lisbon Tanker Brokers, also a very good friend of our collegues here at Atlantis Tankers is also a very talented photographer who has been capturing breath taking pictures of our vessels at the port of Aveiro. We would like to take this moment to thank him for these pictures and his contribution in supporting our Chartering team in the market. Captured by Franscisco's objective is a picture of Atlantis Alhambra departing from the port of Aveiro for her next voyage. Admitting nobody can remember but a good guess goes back to a 5 year renewal of the fleets class contract where Bureau Veritas Marine's General Manager Cafer Tekkan, who is holding the vast majority of maintaining our fleets classification body, and our CEO Lorenz Weinstabl recognized that among the intensive day-to-day work, their teams have little or no time to spend on a personal basis to strengthen their friendship. On the 3rd half year meeting, the team of Armona and BV had a great evening eating fish before the season dives into the fishing prohibition period during summer. As Beşiktaş had the Champions League game with Lyon that day, the atmosphere in Beşiktas çarşı, including Turgut Vıdınlı's was as expected; pulsating. 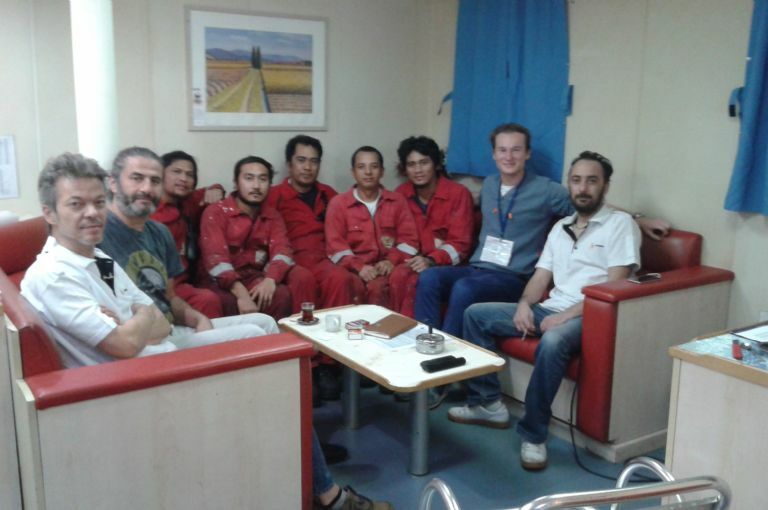 From the left side front to back: Koray Gençsoy, Tarkan Ekler, Lorenz Weinstabl, Semih Falay, Kubilay Görmen and Serdal Sağır. From right back to front: Nazım Kanburoglu, Ömer Balta, Ender Bilen, Cafer Tekkan, Ömer Çalık ve Hülya Cinoglu. What is this? After half an hour of buzzling around the Beşiktaş fish market and inspecting the Turbots’ gill and eye color for indication of freshness, we had concluded the deal for the purchase of 8 kg of fish to satisfy the hunger of twelve people that had worked hard that day to get the Atlantis Augusta registered with the Maltese Flag and to send her on her maiden voyage. 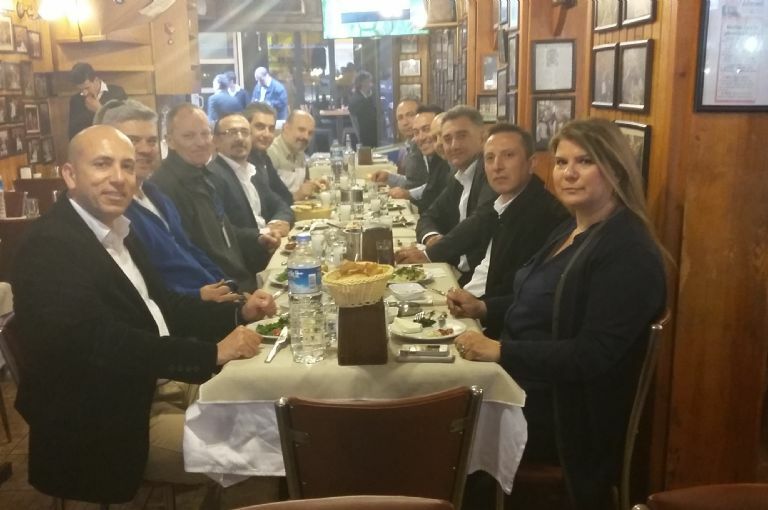 After the fish was certified by Koray in situ it was cleaned, sliced, and sent to the restaurant of Turgut Vidinli, who only Fenerbahçe fans will not have heard of... From left to right: Armona’s New Building Manager Tarkan Ekler, Armona CEO Lorenz Weinstabl, General Marine Manager of Bureau Veritas Cafer Tekkan, and Ships in Service Operational Manager of Bureau Veritas Ender Bilen. Not much difference to report from the take-over of the Lydian Trader compared to the Ionian Trader. Our operator Armona showed muscles by accepting delivery of two vessels within 24 hours. Headed by our senior fleet manager Capt. Gökhan Pehlivan we have taken delivery of the Lydian Trader from Greek owners Enterprise Shipping in Algeciras. Also this delivery took place smoothly in the morning of Saturday Feb 18th and crews were exchanged in the evening. 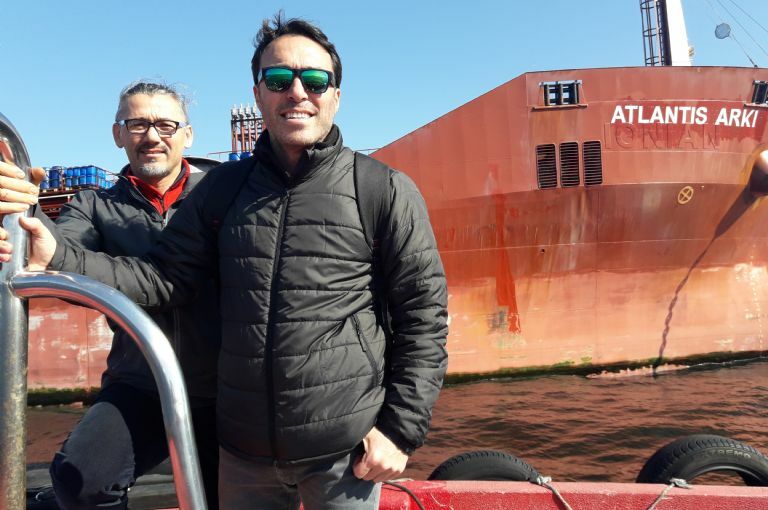 During weekend husbandry and familiarization were instated, and on Monday the vessel went on drift due to the heavy weather conditions that made it impossible to remain at the berth without damage to the ship. We changed class and flag, painted the new name Atlantis Araceli to the sides until Friday and departed to go on her “maiden” voyage in the evening to load 5000mts of gasoil in Mohammedia to discharge in Nador. 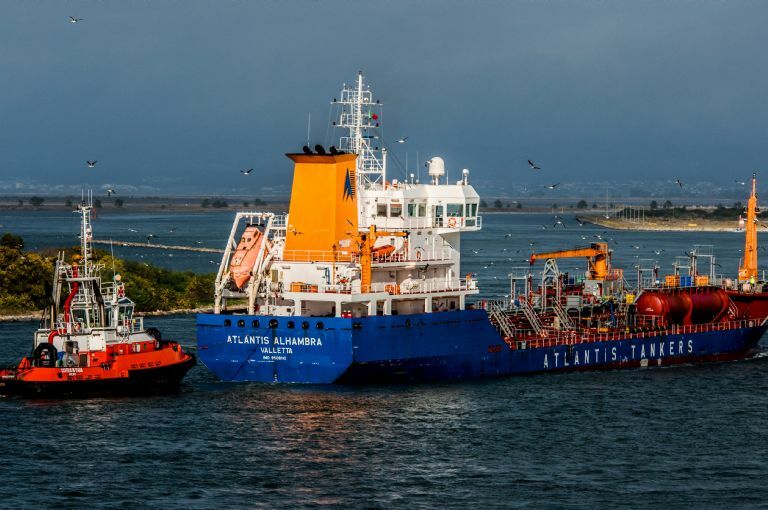 The nomination of ship names at Atlantis Tankers derives from locations of interest our owners have experienced. The ship was given the name of the Philippine port of Araceli, a tribute to our Filipino crew members to give them a taste of home. The Araceli was built in 2008 at Celik Tekne in Istanbul for account of a Norwegian-Turkish joint venture and is equipped with high standard European products such as MAN Augsburg propulsion system and Framo cargo pumping system. She is also a sister vessel to the Atlantis Arki. The deal is supported by a finance with no equity portion and the favourable purchase price signals push to replenish the groups reserves. 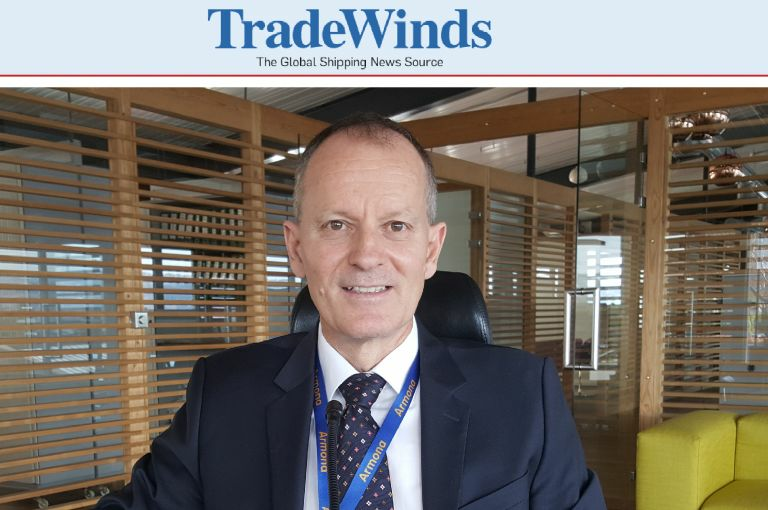 Improving growth aspects as this is part of an effort to move down the cost curve towards more preferred assets, there is renewed concern about a supply glut that already sent ripples through the shipping markets since mid 2016. With a breeze of spring leaping out of this year’s harsh winter doors, our team headed by technical manager Aydin Yilmaz and Operations/Training Manager Capt. 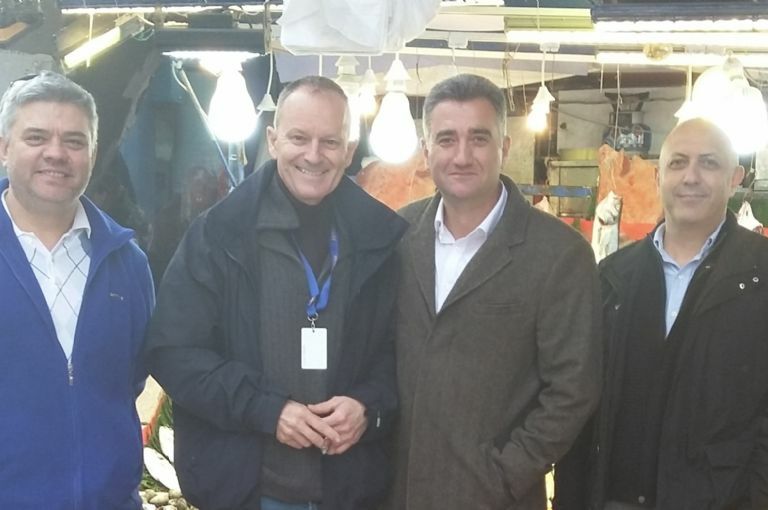 Ömer Balta have taken delivery of the Ionian Trader from Greek owners Enterprise Shipping in Piraeus. The delivery took place smoothly in the afternoon of Friday Feb 17th and crews were exchanged in the evening. The highly professional delivery and acceptance procedure was related to an excellent road map the Greek owners had developed which was followed up by both parties. 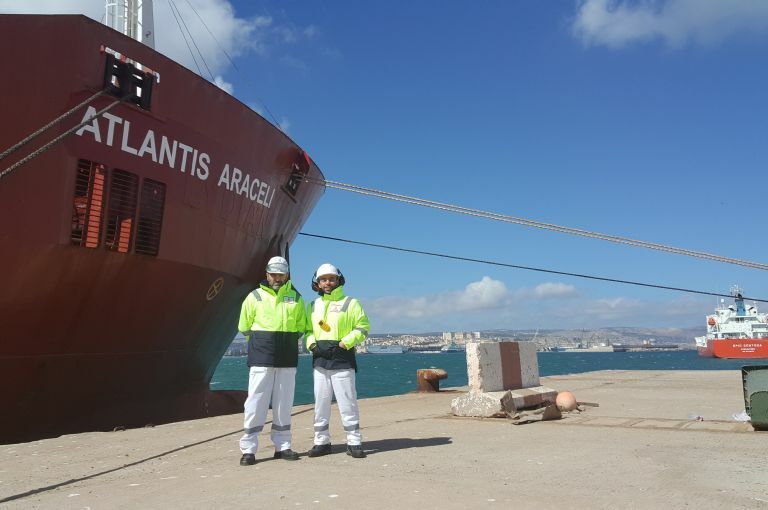 During the weekend husbandry, familiarization was instated and on Monday we changed class and flag, painted the new name Atlantis Arki to sides and could go on her “maiden” voyage in the evening to load 4300mts of vegoil in Novorossiysk to discharge in Bejaia. The nomination of ship names at Atlantis Tankers derives from locations of interest our owners have experienced. Arki is a wonderful little island in the northern Dodecanese near Lipso & Patmos close to the Turkish coast line. It was the first time that Atlantis Tankers had deviated from its policy of providing their fleet only with new built vessels. There are too many substandard vessels on the market especially since 2000 onwards where European yards have lost competiveness and yards in far east became the dominant supplier. The Arki was built in 2008 at Celik Tekne in Istanbul for account of a Norwegian-Turkish joint venture and is equipped with high standard European products such as MAN Augsburg propulsion system and Framo cargo pumping system. The deal is supported by a finance with no equity portion and the favourable purchase price signals push to replenish the groups reserves and improve growth aspects, as this is part of an effort to move down the cost curve towards more advantaged assets as there is renewed concern about a supply glut that sent ripples through the shipping markets since mid of last year. Our Deputy CEO Marlon Weinstabl made an unannounced Senior Management Visit to the Atlantis Armona, the oldest vessel of our fleet. Mr. Weinstabl completed his first Senior Management Visit in 2017 by visiting the Atlantis Armona. The vessel was berthed at 12:30 GMT at Ponte 22 at the Chemical Terminal of Aveiro in Portugal. In the course of 6 hours Mr Weinstabl had the chance to meet with all crew members, tour the whole vessel, and discuss updates to company policies, introduce the most recent Health Campaign on having a healthy diet, Shell’s Resilience Modules, LFI’s such as ‘Chronic Unease’ and ‘Mind Games’ were discussed with crew members, KPI’s, Best Practices, Near-Misses, information on the new vessels joining the fleet, crew remarks and suggestions for improvements were also exchanged and noted. These visits are among the most inspiring events in the daily life of our top management. Discussions always reveal new aspects; especially when crew members share their experience with us. We feel that we are on the right track to strive on our common journey to create the safest working places.